Location: On the west side of the B5101 at Llanfynydd Village. Present state: Demolished - some timber uprights from the platform survive along with the brick foundations of the platform building. Notes: Llanfynydd Station opened on the 2nd May 1898. It was situated on the Wrexham and Minera Joint Railway’s (W&MJR) line that connected Mold with Brymbo. The W&MJR was a joint railway its partners being the London & North Western Railway (LNWR) and the Great Western Railway (GWR). The line had its origins in the Ffrith Branch which ran from Padeswood to collieries in the Coed Talon area. The Ffrith Branch had opened on the 14th September 1849. In 1865 an Act was obtained to extend the Ffrith Branch southwards through Llanfynydd. In 1866 the extension became part of the W&MJR. It opened to freight on the 27th January 1872. The gradients on the original line between Padeswood and Coed Talon were extremely steep. To overcome the difficulties of the steep gradients the LNWR obtained an act in 1866 to build a four and a half mile new line from Tryddyn Junction, which lay a quarter of a mile to the east of Mold, to Coed Talon. This line was completed to Coed Talon in 1870 creating a junction. On the 1st January 1892 the LNWR introduced a passenger service from Mold to Coed Talon. On the 2nd May 1898 the service was extended to run south to Brymbo. 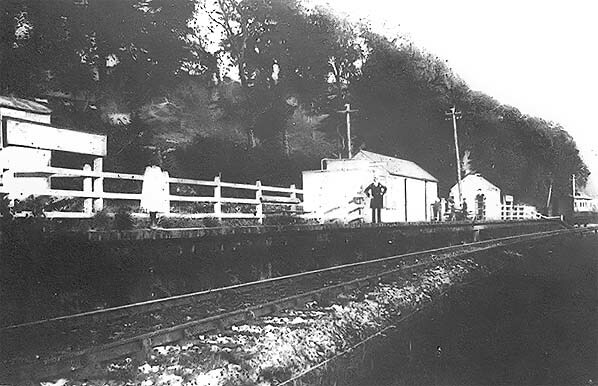 A station was opened at Llanfynydd to serve the local village through which the line passed. like structures that would have provided booking and waiting facilities. A house was also provided on the east side of the line, at the north end of the station for the Station Master. A single goods siding was provided behind the platform with a 5 ton crane standing in the small goods yard, an unusually large crane for a small yard. The station didn't handle livestock but the Crowndale Stone Company and Wooliscroft's Ffrith Quarry both had private sidings between Ffrith & Llanfynydd so it's likely that the station handled some stone traffic. At the time of opening Llanfynydd Station was served by four trains per day in each direction which ran between Mold and Brymbo. The train service was operated by the LNWR. The service could easily have been extended to run into Wrexham as there was a GWR line from Brymbo to Wrexham. The GWR however did not wish to provide the LNWR with a route into Wrexham. Passengers wanting to travel from Coed Talon to Wrexham had to change at Brymbo. By 1904 there were still four trains in each direction between Mold and Brymbo with an extra service running on Wednesday and on Saturday evenings but by 1919 these had been increased to five trains per day in each direction. In 1923 Llanfynydd became a joint line of the GWR and the London Midland Scottish Railway (LMS) after the later had absorbed the LNWR. The LMS operated the passenger service which by 1934 consisted of five trains per day in each direction on weekdays and six on Saturdays. From 1931 however Llanfynydd passengers could no longer travel to Wrexham via Brymbo as the GWR withdrew its passenger service that ran between Wrexham, Brymbo and Berwig. Despite being in a sparsely populated area Llanfynydd Station was fairly well used by local people up until the late 1930s when Crosville Motor Services introduced a bus service that ran from Mold and connected with many of the local villages, including Llanfynydd. The buses took passengers away from the railway. network (London Midland Region). On the 27th March 1950 British Railway's withdrew the remaining passenger trains from the Mold and Brymbo line and Llanfynydd closed as a passenger station. The station remained open for goods traffic until 1st May 1952 with a private siding remaining in use for a very short time after that date after which the line between Coed Talon and Brymbo was closed completely and quickly lifted. 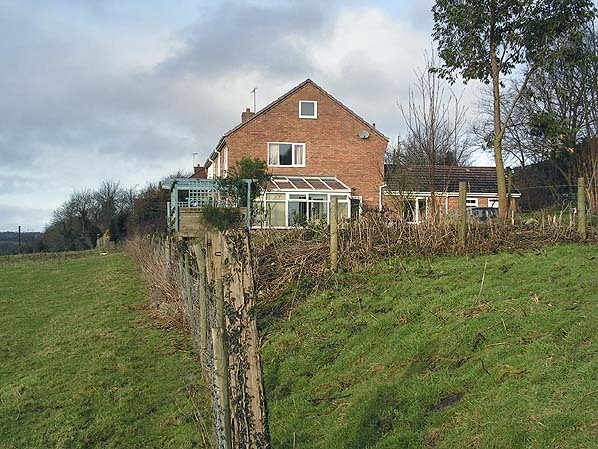 The station at Llanfynydd was demolished and today houses stand on the station site. Looking towards the south at Llanfynydd Station c1910. The timber built single platform station is clearly shown in the picture. The station facilities a little more than wooden sheds. The station did have a goods siding however which is out of sight behind the platform. Looking north at the site of Llanfynydd Station in December 2009. The houses occupy the station site. To the right of the picture can be seen the embankment on which the railway was situated.